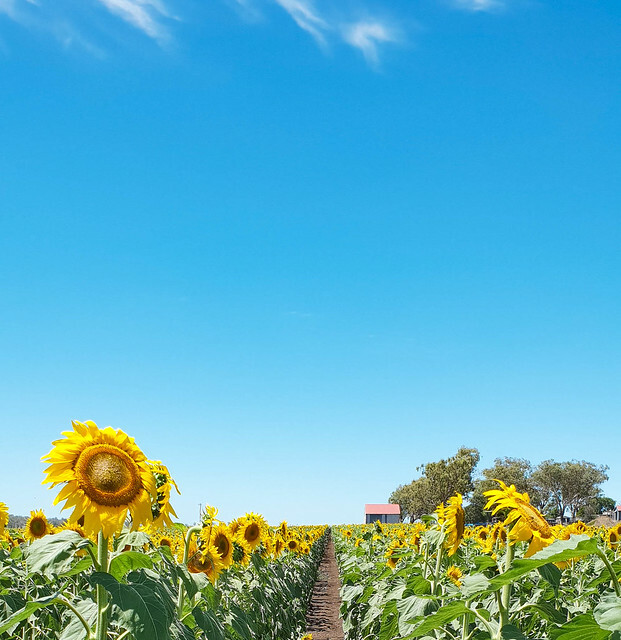 Saturday 5th January was a typical hot Queensland summers day when I decided to jump in the car and head out west to see if I could find some sunflowers that apparently were in bloom all over the Darling Downs. Traffic was pretty good on the way to my first port of call – Allora. I had found out there was a ‘Sunflower Route’ drive that would take me from Allora to Warwick & return so that was my plan of attack. It takes a good 2 hours to drive to Allora from my place and there is one curly bit of road over the Cunninghams Gap where it is uphill & windy. After Cunninghams Gap I had a brief stop at a roadside rest stop to go to the loo & collect myself after the windy road I had just travelled before continuing my on my way. I should also point out that the temperature outside ranged from about 29 – 35 degrees Celsius throughout the trip. Got to Allora – no sunflowers. Drove to Warwick – no sunflowers. Googled ‘sunflower fields’ and found one close by. Went there – no sunflowers. By this stage I had been on the road for a good 4 hours. I was hot, tired and getting a headache so decided to cut my losses and head home. On the way home I did detour at the cute little town of Kalbar and had wee photo/loo stop but after about 6 hours, half a tank of petrol and a lot less patience, I was at home feeling rather deflated – which wasn’t helped by the fact that friends who had been to places not far for me (literally an 8 minute drive north!) and had found sunflowers and were posting them all over social media. I did, for a brief moment, contemplate just leaving it and not worrying about finding any sunflowers this year but being a glutton for punishment, I decided to do the trip again the following weekend. But this time armed with a bit more info of where the flowers might be hiding. Saturday 12th January was another typical hot Queensland summers day and I headed out in pretty much the same direction as I had on the previous weekend but just slightly north of where I had been. 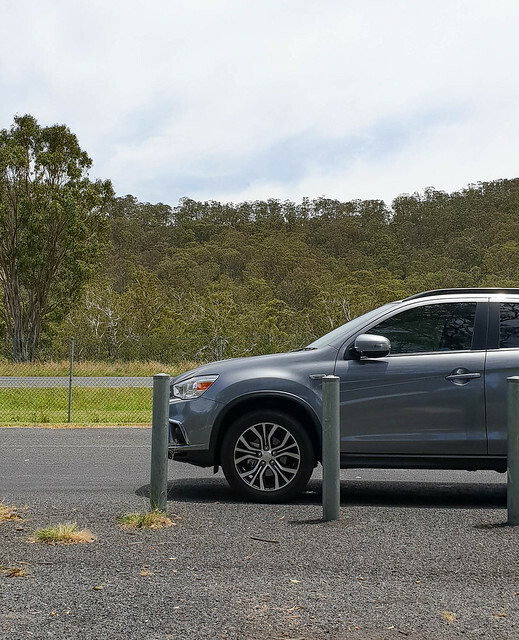 The drive from Brisbane to the Gatton/Esk turn off was better than the previous week because on this route, there is a dual carriageway making it easier and quicker. The road from the turn off to Clifton was surprising scenic and rather rugged. I hadn’t expected some parts of to be rather dramatic (kicking myself for not stopping at a certain point for a photo-op). 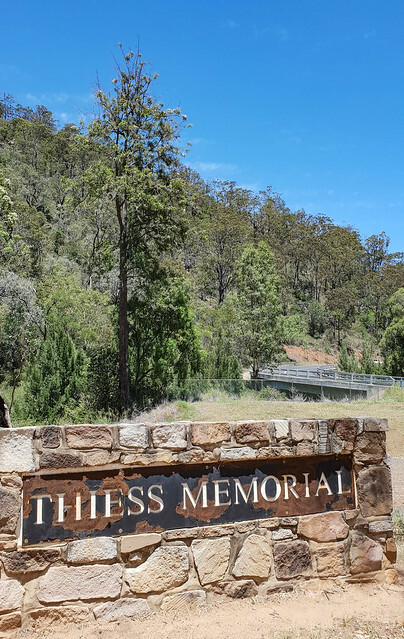 I had a brief loo stop (sensing a theme here) at the Thiess Brothers Memorial in the humble rural beginnings of a company that has become the world’s largest contract miner. 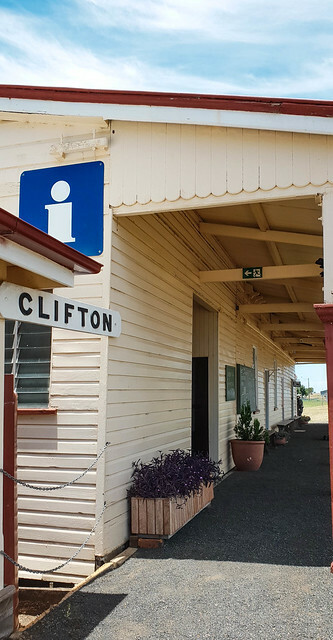 Onwards to Clifton – I drove into this sleepy country town with its water tower and long stretches of road. 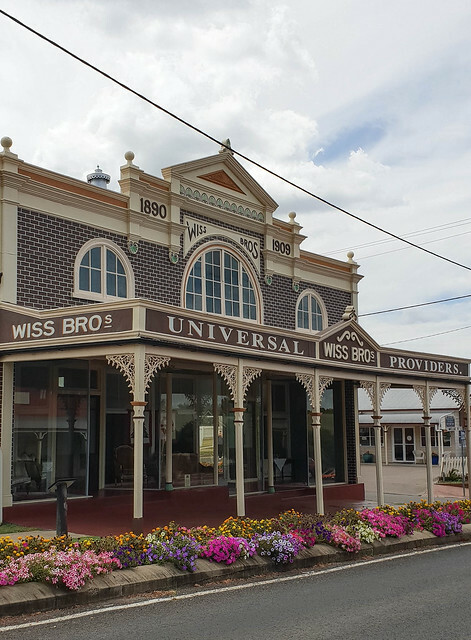 I had plugged in my next destination into the GPS as I drove past the Info Centre at the tiny train station and thought it would be prudent to stop in and see if there were any tips of where to find sunflowers. I met another couple who were also looking for sunflowers and they mentioned to me that there was a field just on the outskirts of town. I also spoke to the lady at the Info Centre and got some more tips, I then headed on my way. As I drove back the way I had come I looked to where the couple had indicated that I would find sunflowers and honestly I have no idea how I could not have seem them when I first arrived in Clifton as I had been driving towards this field of gold in the distance. Operation Sunflower take two was a success. I stopped, took some photos and set off for the next place the Info Centre lady had told me about – a place called Saal Road. She had mentioned to me that it was a horseshoe kind of road – she must have told a number of other people too because as I was heading long this narrow road, a few cars were coming back the other way. I kept going and couldn’t find anything – I was about to give up and turn around too but remembered she had said it was a horseshoe – what she didn’t say was that Saal Road turned into Upper Spring Creek Road. Turned right down Upper Spring Creek Road and a few seconds later on the right hand side were this amazing field of sunflowers. The only other people there were a couple on a motorcycle who were busy taking selfies. I got out and took some photos – it was hot and there were flies everywhere! I decided that this was a perfect spot for a lunch break. I had been so much more organised on the 2nd trip, complete with a packed lunch of chicken sandwiches, couple bottles of water, a packet of Cheezels and a Chomp bar so sat on the side of the road with the sunflowers next to me and enjoyed my lunch. After lunch I headed to my next stop – Hoey Road off Caskeys Road. The sunflowers here were nowhere near as amazing as where I had just been but there were loads more people. Hoey Road is basically someone’s driveway so I headed down the end, did a u-turn and headed back towards Caskeys Road. I stopped and got out for a couple of photos but was kind of unimpressed to be honest – the sky was more amazing. Hoey Road didn’t have the best sunflowers but damn, that sky!! When I arrived I did think that I should tell these folks of a better place for photos but it wasn’t until I was getting back into the car when I saw a lady with two large professional cameras so I mentioned Upper Spring Creek Road to her. She was very grateful and thanked me for the tip. Fast forward to Sunday, I noticed I had a message on Instagram, it was someone asking if I had given a person a tip on where to find sunflowers the previous day. Turns out that the person I gave the tip to and I follow each other on Instagram. Small world indeed! 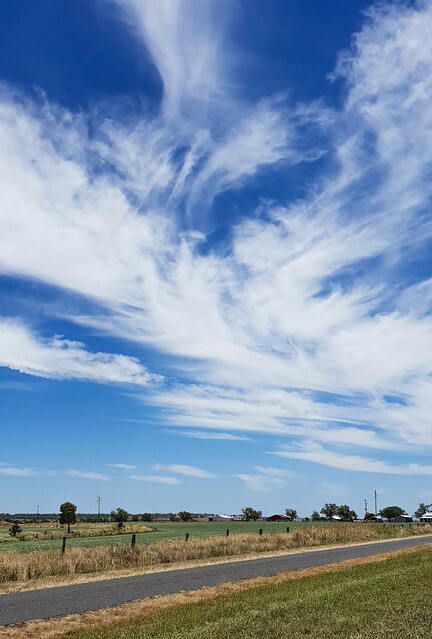 After Hoey Road, I headed north to Nobby – briefly detouring to get a photo of a quintessential country scene I had passed earlier along Saal Road. There was nothing on the road to Nobby so I headed west towards Felton. I was at an intersection where I was meant to go right but just ahead of me on the left I could see a couple of large fields so I turned that way instead – so glad I did. This was my fourth sunflower field of the day and it was by far my favourite. I was the only person there – apart from the always present flies and there were no fences. It should be noted that these fields are a farmers livelihood and should be treated with the utmost of respect. 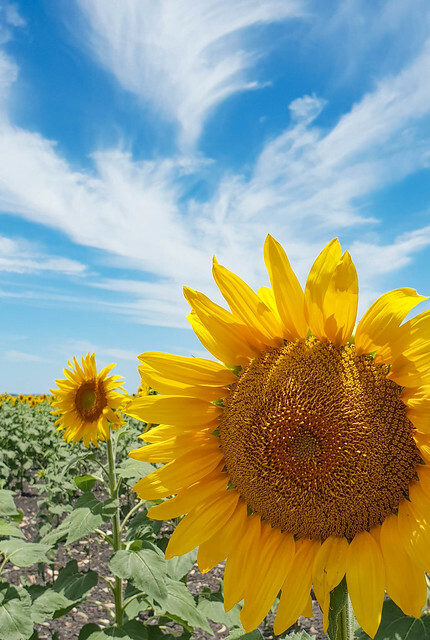 You should not go into the fields – unless you have specific permission from the farmer and you definitely should not cause any damage to the sunflowers. With the first field I went to, I actually did go into the fields because others had but I actually felt really guilty about it so the other fields I found that didn’t have fences, I made sure I stayed to the outside of the fields. Not only is it basically trespassing but I was told at the Clifton Info Centre that there can also be snakes in the fields – I wasn’t taking any further chances! I loved this field, the fact that I was the only person around really did make a difference – I felt like I was in my own little sunflower heaven. As I was preparing to leave, another car did turn up but that was ok because I was on my way again. I found one more field on the way to Cambooya, where I found the largest sunflower of my life – it was literally bigger than my head. Another loo break before the trip back to Brisbane and that was my day done – well apart from a last-minute decision to go to Slacks Creek to visit my great, great-niece and show her the photos of sunflowers – which I am sure at nearly 6 months old, she really appreciated (she did actually seem to really like seeing them, truth be told). What did I learn between the first & second trips? Visit or contact one of the local Information Centres – they definitely have their finger on the pulse of where flowers are in bloom. Chat to people on social media about where they found sunflowers – I had a couple of people who I follow on Instagram who had also been to see the sunflowers so I messaged them to find out where exactly they had been. Don’t be afraid to reach out to others. Take a packed lunch! People at work laughed at me about this but honestly with all the driving I was doing it was easier to pull over the to the side of the road as opposed to finding a cafe or pub to get something to eat. Also take water – especially in QLD where it gets stupidly hot. If you see a loo (toilet), use it. Sometimes you will drive for a while before coming across a rest stop or town with public toilets – at one point I even searched for toilets in my GPS to find the closest one. Have fun! The big difference between my first and second trips was on the first I had this expectation that I was definitely going to find sunflowers and when I didn’t I got really disappointed about the whole trip and thought it had been a waste of time. The little pit stop at the town of Kalbar was the highlight of an otherwise very disappointing day. On the 2nd go around, I had the attitude that if I didn’t find any that was ok, it was still a nice a day a drive and that I never know what I might find in my travels. Do you love sunflowers? Would you go on a day trip just to find some? Both days were definitely long travel days, along with the heat and getting in & out of cars, I am really only just getting back to normal haha. But I have to say that it was totally and completely worth every minute – even the day I didn’t find them because I think it made me appreciate the 2nd trip a lot more. I love the idea of hitting the road for a day in search of a field of sunflowers; it’s very hippy-like. 🙂 Your pictures are absolutely stunning (as per usual), but I’m sure they don’t do the fields any kind of justice. The first ever flower I planted and grew was a sunflower and I snapped a picture of it in full bloom with a butterfly on it. I’ll post it in a comment over on your Facebook page; I think you’ll like it. It was a fun trip.. if not a bit too hot. When it gets hot in QLD the flies come so you are forever swatting flies away from your face.. so annoying haha. It was a bit of a long day with lots of driving but still worth it. Sunflowers just make me happy. When I thought I had finished and wouldn’t stop any more I kept coming across another field & of course stopped for more photos haha. I’d love to see your photo!! Butterflies & sunflowers! Can it get any better? worth the effort; gorgeous photos of beautiful Australia. I just love sunflowers. It was definitely worth it all in the end.. sunflowers are such a happy flower!